The world is in the midst of an insect extinction crisis. We’ve all heard about the plight of bees, but the plight of all insect fauna is much less widely appreciated. 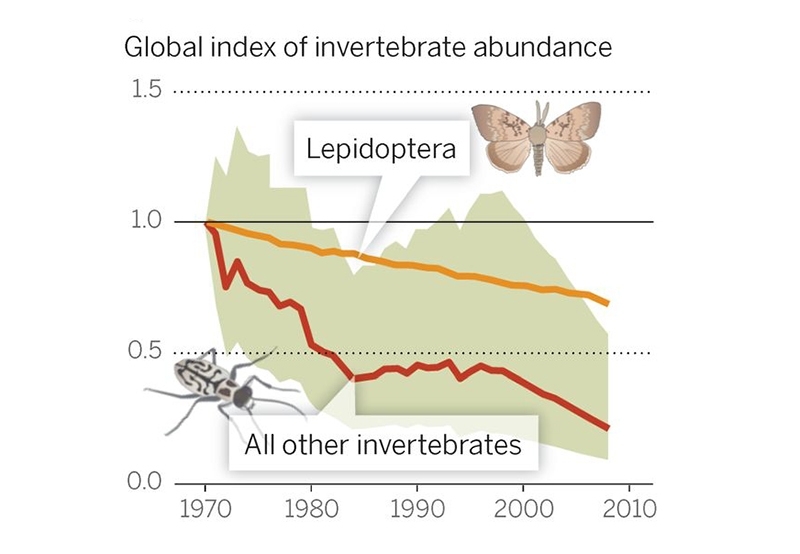 The figure below is from a report in Science a few years ago showing the precipitous decline in insects worldwide. What beekeepers and naturalists have known for a decade, that the insect apocalypse is upon us, recently made the New York Times Magazine. If this is your first encounter with the evidence of severe loss of insect populations, I would suggest reading Brooke Jarvis’s NYT Magazine piece before continuing here. A couple of recent studies further highlight the losses. Present declines suggest that 40% of insect species will go extinct in the next few decades. Three quarters of the insect biomass in Germany is already gone. One of the main drivers of the loss of insect biodiversity is agricultural practices and the use of synthetic pesticides. In the face of an impotent federal Environmental Protection Agency (EPA), the individual states should step into the breach and do what is necessary to ensure that their lands are not part of the insect apocalypse. The United States EPA, our nation’s watchdog and regulator, is tasked to ensure toxic chemicals do not harm the environment or people in our communities. States have traditionally adopted the EPA regulations as their own when it comes to statewide standards and when enforcing compliance with the regulations. Although the Federal Insecticide, Fungicide, and Rodenticide Act (FIFRA) gives the EPA the authority to determine use of pesticides in the United States, the states are allowed to enforce stricter regulations if they are so inclined. For example, California automobile emission standards are stricter than the the Federal mandated levels. The process of setting regulations to restrict the use of a particular pesticide is often a hotly contested, politically-charged debate between the stakeholders. A viable decision process requires input from all parties, scientifically sound research and decision making, and some immunity from political pressure. For many years of its existence, the EPA did its best to make sound, scientifically-based decisions. But the EPA has a historically fraught relationship between advocates for public and environmental health and the agricultural chemical industry. With the Trump administration, the EPA has been under direct attack. Trump’s now disgraced and resigned EPA director Scott Pruitt was openly hostile to the EPA’s mission. In 2017, Republican congressmen introduced a bill to abolish the EPA. Employment at the EPA has dropped about 10% so far during the Trump administration. The policy seems to be to allow the agency to dwindle in size due to attrition and retirement with no new hires replacing leaving workers. All of this has left the agency with low morale and inadequate staffing to fulfill its mandate. This situation leaves the states without leadership from the EPA on issues of chemical and pesticide safety. Without a strong EPA, individual states must take up the mantle of protecting their citizens and wildlife from hazardous chemicals. Unfortunately this is an enormously difficult task, requiring a staff that can assess scientific research, direct additional research as necessary, promulgate regulations, and interact with stakeholders in a responsible manner. So far, only a few of the larger states, such as California, have taken on this task seriously. Fortunately, there is a good alternative to the EPA to look toward for guidance, and that is the European Union’s (EU) European Food Safety Authority (EFSA) and the European Commission, which adopts the scientific findings of EFSA into rules to be followed in the EU. The regulators in the EU have perhaps an even more difficult job than those in the US, since the regulation they promulgate apply to the 28 sovereign member nations. This political reality places a large burden of integrity on the EFSA scientific review process, and also ensures that it is shielded somewhat from political pressure. As a result, the EU pesticide guidelines may be considered as a reasonable substitute for EPA recommendations. Although the states are not required to follow pesticide restriction more stringent than those imposed by the EPA, they are allowed to makes such rules if they see so fit. A prudent approach would be for states to accept both the EPA and EU guidelines as a starting point, and only relax the EU regulations (when they are stricter than the EPA’s) upon review by the appropriate state regulatory agency. This would place the burden of proof for exceeding the safety rules, promulgated by the EU with the scientific backing from EFSA, on the industry stakeholders at the state level. Adopting EU standards at the state level is not an extreme position. The list of 520 EU approved active ingredients still contain 206 that fall on the Greenpeace Pesticide Blacklist. The need for regulations stricter than the EPA requires is evident in several areas if we contrast them with EU guidelines. Some of the substances allowed in the US but not in the EU include the herbicides Atrazine, Acetochlor, Metolachlor, & Paraquat, the fungicide Methyl Bromide, the insecticides Carbaryl (Sevin), Naled, Permethirin, and neonicotinoids Dinotefuran (Wilsonville OR bumblebee culprit), Nitenpyram, with severe restrictions on Imidocloprid, Thiamethoxam, and Clothiandin. A small portion of a database I compiled showing the most common of more than 2000 substances is pictured below. Green lines are approved in the EU; yellow are pending approval; red lines are not approved. The orange lines are the neonicotinoids restricted to indoor greenhouses only in the EU. 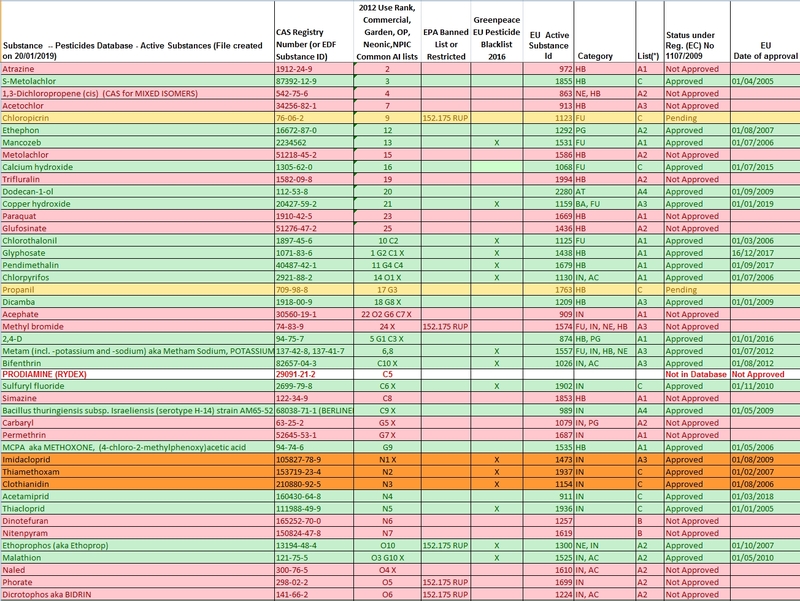 Portion of pesticide database showing commonly used chemicals and EU approval status. Groundwater pollution with Atrazine is rampant in much of the United States. Why this is still allowed by the EPA is a mystery. Beekeepers have been asking for restrictions on the neonicotinoids for over a decade without meaningful action from the EPA but the EU commission has taken the action necessary to prevent further environmental harm from these chemicals. Every chemical has a story and there are thousands of them. With the EU approach, chemicals are restricted from use unless they are specifically approved. Right now there are about 500 substances that are approved for use in EU. Many argue that the EU regulations are not strict enough. For example, the Greenpeace EU Pesticide Blacklist, compiled with a eye toward the environmental consequences of the EU approved chemicals, would restrict further about 40% of the EU approved substances. The efforts of Greenpeace and similar environmentally concerned organizations put pressure on the EU to make approval changes. The insect apocalypse fuels these efforts and adds to the urgency for local and state jurisdictions to take immediate action. The current level of regulation is failing us. Adopting EU regulations in states would be a significant step in the right direction, and would be a signal to the EPA to do its job. So yes, it would be a change and a significant restriction in the use profile of chemicals in our state, but one that is long overdue and has a basis in science and regulatory oversight. Adopting EU approvals for chemicals promises a healthier environment for all people and wildlife in our state. The catastrophic consequences of a world without insects is almost unthinkable, and we are precipitously close to that reality. It’s time to act. Jarvis B, (2018) The Insect Apocalypse Is Here. New York Times Magazine Nov. 27, 2018. I always wonder about genetically modified crops with BT (bacillus thuringiensis) genes and it’s collateral damage. Regular BT is considered a more environmental solution to controlling caterpillars since it only effects caterpillars during a specific stage of their life. It is typically applied at a specific time to target the particular pest of concern so diffrent caterpillars in other life stages are not effected. BT is a Bacillus rather than a chemical so doesn’t taint the water or ground. I imagine when BT genetics is incorporated into a plant then the plant produces BT during the entire season rather than just at the time of application. This GMO BT in my mind would then effect non target caterpillars because of it’s prolonged presence. Have you came across any information on this? I have never heard of studies on it.